In the top of the first inning, Chicago got two men on base, by a walk and an error, but did not score. Claude Cooper, a 22-year-old outfielder, led off the bottom of the first by hitting a sharp grounder to Jack Farrell, Chicago’s 21-year-old second baseman. Farrell made “a pretty play ... scooping the ball with one hand while tearing over at top speed, and throwing without straightening up.”15 He showed why people were calling him “the second Johnny Evers.”16 Brooklyn failed to score in the inning, despite Al Shaw’s double to the right-field wall. With two outs in the top of the second inning, Farrell drew a walk and Fiske singled over second base. Austin Walsh, a 22-year-old outfielder making his first major-league start, followed with a clean single to center field, scoring Farrell with the first run of the game. Tinker followed with a long drive to left field and was robbed of a home run by Cooper’s spectacular catch. Brooklyn scored a run in the third inning, with singles from catcher Yip Owens and pitcher Lafitte. In the fourth inning, Shaw again doubled to the right-field wall but failed to score. Chicago scored twice in the fifth, with a triple by catcher Art Wilson, a double by outfielder Dutch Zwilling, and a sacrifice fly by first baseman Fred Beck, to take a 3-1 lead. The Chi-Feds threatened again in the sixth by loading the bases but did not score. With two outs in the bottom of the sixth, Brooklyn first baseman Hap Myers tripled to left field, past Walsh. The speedy Myers had stolen 57 bases in 1913 for the Boston Braves of the National League. With Shaw, who had already doubled twice, at the plate, Myers foolishly tried to steal home off Fiske and was tagged out easily by Wilson for the third out. Myers “was so sore that he picked a fuss with Wilson ... but umpires and players intervened and shooed the irate Myers to his job [at first base].”17 In the top of the seventh inning, two misplays by the Brooklyn defense handed Chicago another run. Fiske was steady through six innings of work, allowing one run on five hits, but the Tip-Tops got to him in the bottom of the seventh. Shaw started the rally with a solo homer over the right-field wall. Wilson muffed Steve Evans’s foul pop, and, given a second chance, Evans doubled to right field. Tex Wisterzil lifted a popup that fell between Tinker and Zwilling (either could have caught it but “neither did fearing a bump”19), and Evans scored. After Owens singled, Jim Delahanty pinch-hit for Lafitte and singled to left field, driving in Wisterzil with the tying run. The final score was Brooklyn 5, Chicago 4. The winning pitcher was Sommers; the loser was Watson. The Chi-Feds left 12 men on base. Robert B. Ward died on October 18, 1915, at the age of 63.22 According to Brooklynballparks.com, Ward’s ballpark at Washington Park was used until the end of 1917 as a venue for “track and field, college and high school football, professional boxing, and even a visit from Buffalo Bill’s Wild West Show.” The stands were demolished in 1926. The Ward Baking Company lives on in the form of corporations descended from it, including the makers of Wonder Bread and Hostess products. 1 Wichita (Kansas) Beacon, July 23, 1914. 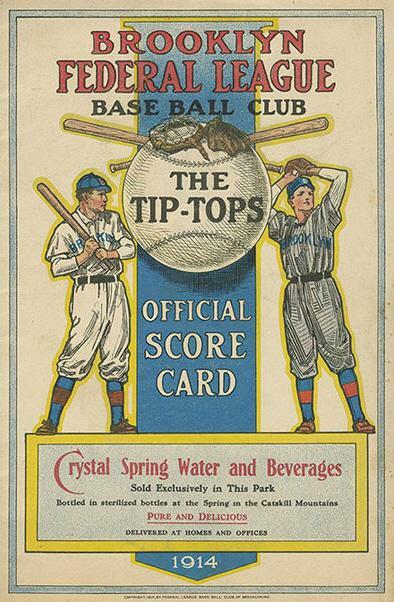 2 Baseball Magazine, July 1915. 3 Robert Peyton Wiggins, The Federal League of Base Ball Clubs: The History of an Outlaw Major League, 1914-1915 (Jefferson, North Carolina: McFarland, 2009). 4 Baseball Magazine, January 1917. 5 Brooklyn Daily Eagle, May 12, 1914. 6 New York Sun, May 10, 1914. 7 New York Sun, May 1, 1914. 8 New York Tribune, May 9, 1914. 9 New York Times, May 12, 1914. 10 New York Tribune, July 25, 1914. 11 New York Times, May 12, 1914. 12 Retrosheet.org, through games of July 23, 1914. 13 Wiggins, The Federal League. 14 Jim Leeke, “Ed Lafitte,” SABR BioProject,	http://sabr.org/bioproj/person/07d30704. 15 Chicago Daily Tribune, July 25, 1914. 16 Brooklyn Daily Eagle, July 25, 1914. 17 Chicago Daily Tribune, July 25, 1914. 18 New York Tribune, July 25, 1914. 19 Chicago Daily Tribune, July 25, 1914. 20 New York Sun, July 25, 1914. 21 Wiggins, The Federal League. 22 Bakers Review, November 1915.